Plastic injection molding is a widely used method of producing machine parts and other products. Injection molding is mostly used in the manufacturing industries because of its superior benefits compared to other forms of plastic molding. Molds created using plastics are reliable and efficient in parts manufacture. The article will explain some of the benefits of using injection molding to produce various machine parts and components. The high-pressure plastic goes through when pressing against the mold makes it possible to add more details to the design. High pressure enables you to come up with the complex shapes that will cost more using another molding method. Once the pressing is over, the actual molding process takes a shorter time compared to other molding methods. The plastic injection molding process allows for the creation of many parts from a single mold. Therefore, companies dealing in injection molding services can increase their output cost-effectively and efficiently. The use of fillers in plastic injection molds help reduce density and add strength to the molded section. Fields that require molded parts to be strong and durable leaves plastic as the only practical option in the injection molding processes. 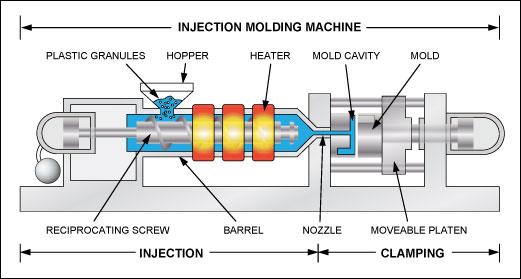 Co-injection molding is a technique that allows you to use different plastics on the same part. This method rules out using only specified types of plastic. Most machine parts modeling that uses injection molding are produced by machines and robots controlled by an operator. Automation reduces manufacturing costs because of the reduced overhead and labor costs. Therefore, your consumers will purchase your products at a reduced price. Machine automation allows for the creation of accurate injection molds controlled by Computer Aided Design (CAD) and Computer Aided Manufacturing (CAM). The two technologies allow for close tolerance during mold design. All machine parts produced through plastic injection molding are similar in every dimension. You do not need to adjust any settings if the intention is to come up with the same design bearing similar features. The manufacturing process is accurate, therefore making fabrication a more straightforward process. If you are paying attention to sustainability, plastic injection molding is a process that benefits the environment. Its ingenuity is evident when the exact amount of materials needed for manufacture is used on a mold, and the excess is grounded for the next process. Using multi-cavity tools enables fast cycle processing that increases production output while reducing energy consumption. Another way of limiting negative environmental impact is through restricting the variety of plastics used on every product. Using different plastics is problematic to the consumers who try to recycle after use. The use of injection molding services from a trusted company guarantees minimal work after the production process. The reason behind this is that most molds from plastic have an almost finished appearance once molding is complete. The use of plastics rated as environment-friendly means that remnants of the original process can be re-used to minimize wastage.